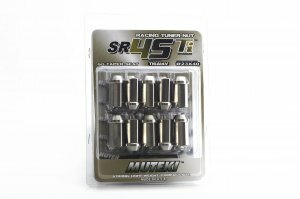 Wheelmate Performance is proud to introduce our brand NEW Muteki SR45 Titanium lug nuts. Each lug nut is made from the highest grade TI6AI4V titanium alloy and features a 60 degree oversized conical seat for better contact on your wheel. The SR45Ti are specifically engineered to withstand the rigorous off-road abuse in the professional racing circuit. We are proud to say that the SR45Ti series are ?MADE IN U.S.A.?.